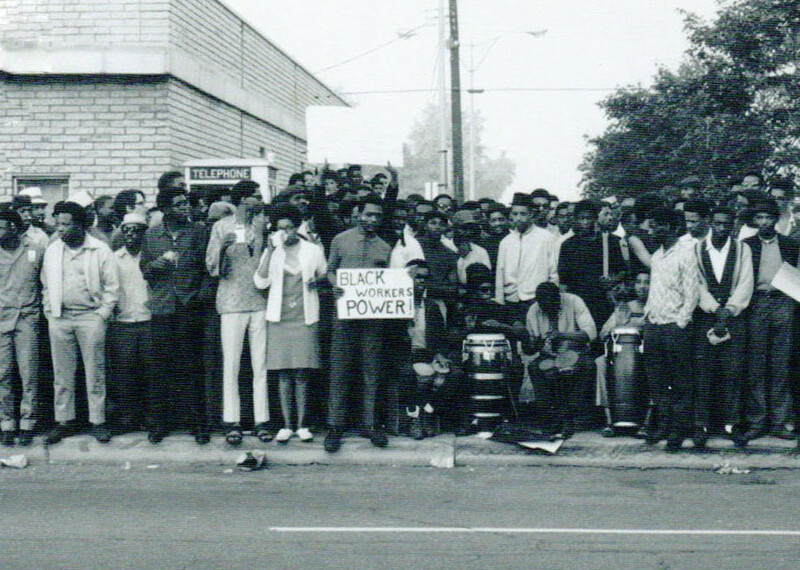 From Mike’s notes: The initial action from DRUM involved black workers wildcat strikes that shut down Chrysler’s Dodge Main and Eldon Gear and Axle assembly plants to protest racial discrimination, safety violations and poor working conditions. The immediate impact was that it forced the auto industry and the UAW to deal with the reality of racial discrimination that dominated these institutions. This resulted in changes that gave black workers access to all parts of the industry with the exception of skilled trades which even today, continues discriminatory practices throughout the industry. The Detroit walkouts by black workers impacted nearly all industries on the West Coast and the Northeast states. Some token changes occurred in the South and Midwest. Wildcat strike Dodge Main 1968. Photo courtesy General Baker. The League’s long-term strategy was to confront racism wherever it existed by using the strength of black workers and hopefully of white workers to destroy the second-class citizenship of black people. Black workers took the lead and created the League, an umbrella organization that linked and incorporated black groups in work places and community organizations. We planned strikes, boycotts, public shaming; we were open to any means necessary. Our fight is as necessary today as it was at the time because racism is so pervasive, so hardened as evidenced by threats to our right to vote, loss of power by unions, and the deterioration of our communities due to the growing wealth disparity and reckless use of corporate power in the U.S. today. Read more in A Black Revolutionary’s Life in Labor: Black Workers Power in Detroit a new book by Michael Hamlin with Michele Gibbs. Purchase a copy of Mike’s book on our website www.againstthetidebooks.com/books/. Follow our blog by clicking “follow” on this website. Visit us on Facebook: Against the Tide Books. Also available from Amazon.com, Barnes & Nobel.com, SOURCE Booksellers in Midtown Detroit and the Charles H.Wright Museum of African American History. This entry was posted in Uncategorized on June 1, 2013 by joanncastle.